You Say Potato, I Say Potato Soup? by Barb April 19, 2011 August 26, 2011 12 Comments on You Say Potato, I Say Potato Soup? Ahhh, spring is here. New exciting crops of vegetables will soon be at our fingertips. Our grills will be sizzling making dishes we missed over the long winter. And I will have a big pot of soup on the stove? Yes, I said soup! This spring weather is taking its sweet time getting here in the Midwest and I need to keep warm. This morning it was in the 30’s and the cold is just biting at my soul. So as much as I would love to be grilling asparagus and brats, I have to continue to make my winter fare until Mother Nature comes out of hibernation. Nothing says warming comfort to me than a baked potato. This humble vegetable has a hardiness that is underrated by most people. (Yes Irish Readers, I know I’m not telling you anything new). The rich, starchiness of the potato will keep you toasty for the rest of the day. One potato isn’t enough to keep this carb lovin’ woman satisfied so I make Baked Potato Soup. 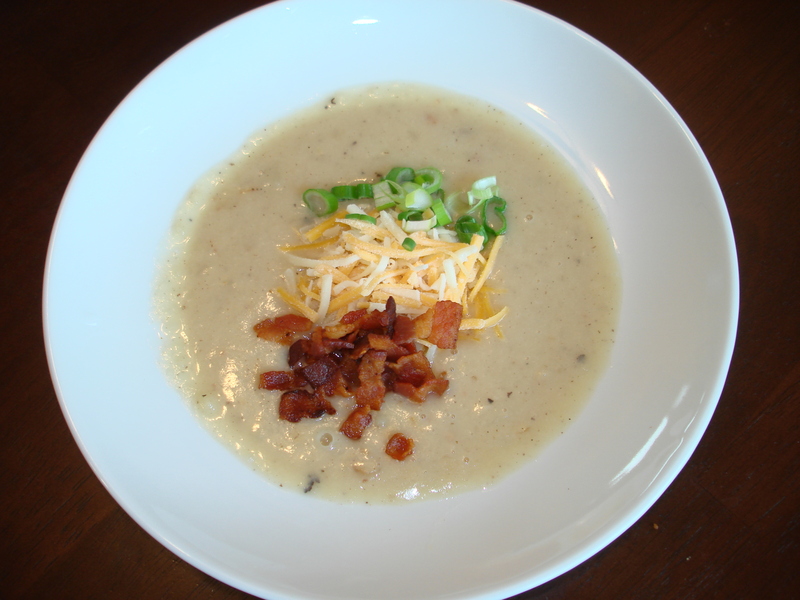 I think it is easier than regular potato soup because the potato preparation is effortless. All you have to do is scrub your spuds and bake them instead of cleaning, cutting and boiling them like in a standard potato soup. The other thing I adore is the familiar flavor of a baked potato with all the trimmings in a bowl of creamy goodness. 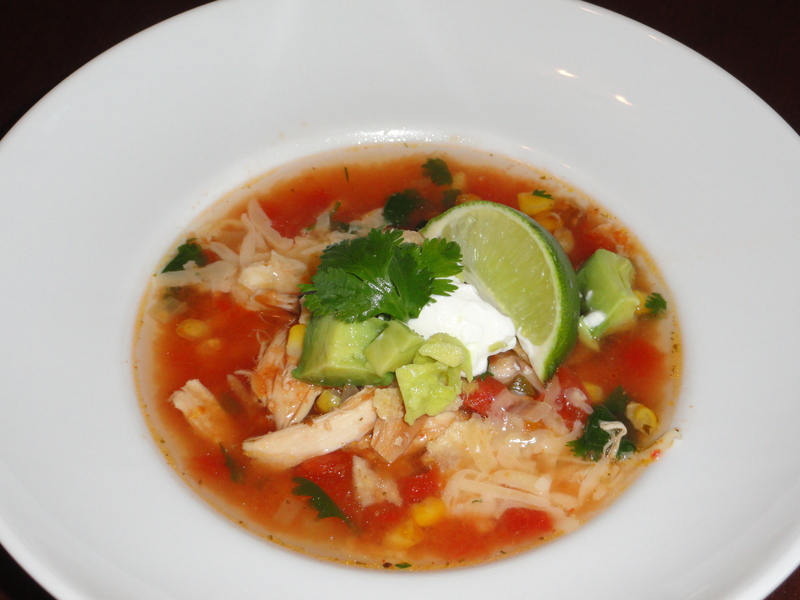 There is coziness to this soup that is the right prescription for my Spring-Cabin Fever! Bake potatoes using your favorite baking method. Make sure the potatoes are completely done. I bake mine at 450 degrees for about 45-60 minutes. Scoop out the flesh and mash a little and set aside. Cook the bacon in a large soup pot until crispy and remove. Dispose of all but 1 Tbsp of the bacon fat. Coat the onion in flour and cook 2-3 more minutes. Slowly whisk in the milk and then the broth. Simmer until the soup thickens up about another 5 minutes. 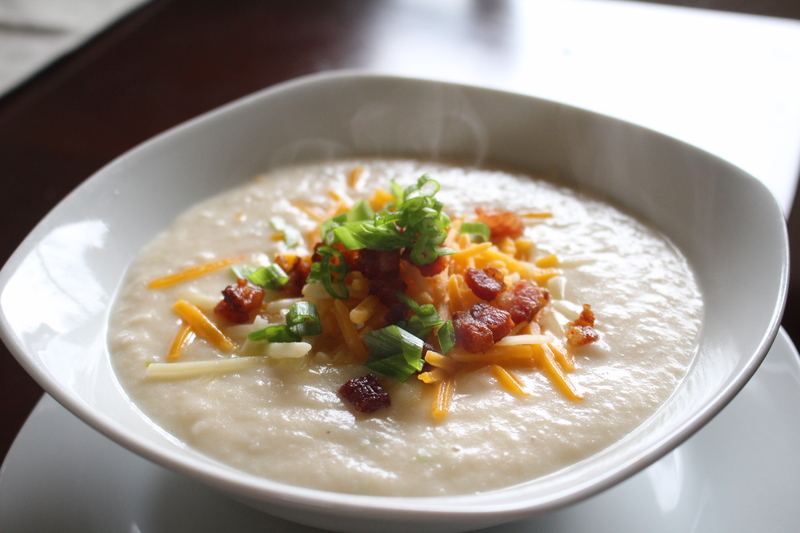 Load the top of your soup with your favorite baked potato toppings like bacon, cheddar and green onion. 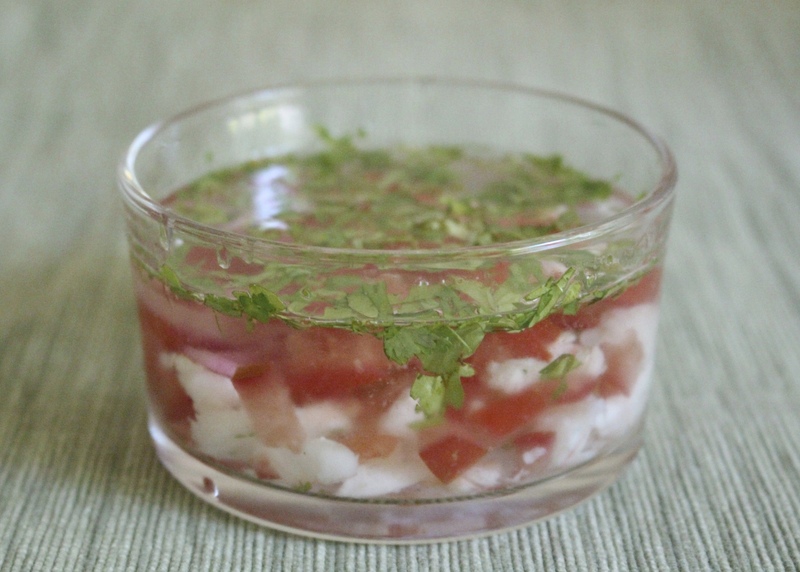 There is nothing like a tuber in your tummy to help prepare your body for the winter’s delayed thaw. This is a really nice soup!!! And I love the little potato chunks in it. Don’t forget the fixings on top! Thanks Denise. This has been a favorite of mine for years! Greetings from Colorado! I’m bored to tears at work so I decided to check out your blog on my iphone during lunch break. I enjoy the information you provide here and can’t wait to take a look when I get home. I’m shocked at how quick your blog loaded on my phone .. I’m not even using WIFI, just 3G .. Anyways, wonderful site! Sorry to disappoint you. I will try to stay on track! I appreciate your kind criticism. Heard of your blog thru your friend on CW. Voted for you after I saw your first recipe!!! Great site. For an extra bit of rustic-ness, chop up some of those potato skins and throw them in also! Perfect for a cold, wintery mid-western nights! Thanks Steve!!! I appreciate the support. Great Early morning, I just stopped in to visit your internet site and believed I’d say I appreciated myself….